Cabinets are the perfect addition to cabin decor because they not only look great, but serve a practical storage purpose. 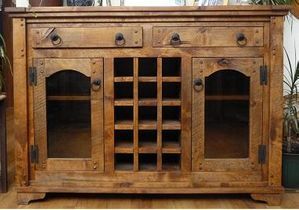 The right piece of rustic furniture can make a big difference in a room, so we have created a wide selection of cabinets to choose from. We offer ready made and some custom sizes in our cabinets. We've drawn from all types of cabinets to make it easier to pick exactly what you are looking for from our selection. Some seem designed for the dining area, but most are versatile and suitable for other areas of your home. Please enjoy looking through the choices we offer.